Super Pro ET racer Derek Flynn was showing off his very nice-looking new Gold RV Racing dragster. The Tube Carz chassis totes a 509ci Checvy and Littlefield blower, which have produced more than 1500 hp on the dyno. "It's tecched, it's all ready, and I can't wait to go! ", he said. "I am looking for 200 mph with this set-up. It will be a learning curve because I haven't been quicker then 8.36 and I have never driven a blown car before, but Steve Johnson and I have shaken on running side-by-side 200s". Also showing on the Gold RV stand was Arlo Reddick's Junior Dragster which looks as if it has been covered in gold leaf. "J&W and Gold RV are manufacturing Junior Dragsters", said Derek. 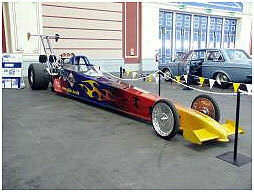 "We can supply Stock, Modified, or Modified Advanced dragsters. We are also now the European agency for Tube Carz chassis, so if you see any Tube Cars chassis which you like then we can bring them in for you."